The toddler years are packed full of important milestones. However, not all of them are happy, joyous occasions. One particular milestone many parents struggle with is their toddler’s first haircut. While some children are quite happy sitting down in the salon and having their hair hacked off, others are a lot more reluctant! Some find it a really scary experience, while others simply don’t like having their hair messed with by someone they don’t know. 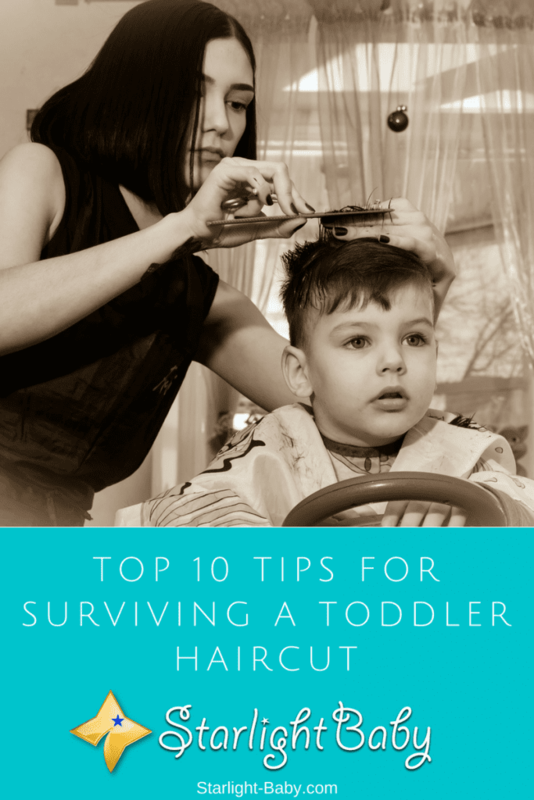 So, if your little one finds the whole experience traumatic, here you’ll discover some of the top tips for surviving a toddler haircut. Before heading to the salon, it’s a good idea to check whether your toddler is tired or hungry. If they are, there’s less chance they will sit there calm and patiently. If you make sure they’re fed and they’ve had plenty of rest before you go, it will make the world of difference. So, try to book the appointment for when your little one is most likely to be in the best, laid back mood. Nothing works better than a good distraction! Take plenty of snacks and toys with you to ensure your toddler doesn’t get bored. It’s a good idea to check with the salon owner to see what toys are allowed. Some for example, may cause a distraction to the hairdresser so they may restrict which items your little one can take with them. Similarly, a pacifier can also work wonders if they use one. This will help to ease the fear your toddler has over getting their hair cut. After the haircut, your little one may end up feeling really uncomfortable due to the loose hair which can fall down the neck and back. So, taking a spare change of clothes will help your toddler to feel comfortable afterwards. This is actually important as it’s not just the haircut itself which can be off-putting for your little one – it’s the uncomfortable feeling afterwards. If they itch and feel uncomfortable after the haircut, that’s what they’ll start associating it with and they’ll be more likely to play up the next time a haircut comes around. It’s definitely worth taking your toddler to a salon that’s experienced with cutting children’s hair. Ideally, you’ll want one which solely cuts children’s hair as they have the experience and skills required to make sure the process is as hassle free as possible. These types of salons also tend to have plenty of toys and distractions you can use to keep your little one happy. There’s a right way and a wrong way to prepare your toddler for the salon. The trick is to turn it into an exciting adventure. It also helps to avoid the word “cut”. In your toddler’s mind this is a very scary word, so replacing it with something such as a “trim” is much better. Telling your child that they’re getting a new hairstyle can also be a less intimidating way of phrasing it. You can also build it up as an activity big children do and how lucky your toddler is to be getting a grown-up treatment. Toddlers generally like to copy their parents and feel much more grown up than they actually are. One of the biggest mistakes parents make when it comes to toddler haircuts, is making them go through with it. The trouble is, if your toddler is really upset and fearful of having their hair cut, it’s definitely not going to help them to overcome their fear if you force them to sit through it. In fact, it’s more than likely going to make the situation worse. They’ll start to dread going to the salon and you’ll set yourself up for many more tantrums to come. A good tip is to start trying to cut their hair yourself. This will at least get them used to having their hair done in a comfortable, familiar setting. Another great tip is to have your own hair cut while you’re at the salon. That way, your toddler can see what it’s all about. Once they witness you having your hair cut, they’ll see it isn’t anything to be worried about. It also goes back to the point made earlier, about children loving to follow their parent’s example. It’s tempting to see your toddler’s haircut as an excuse to enjoy a little “me time”. However, if you leave them, you increase the likelihood that they’ll throw a full-on tantrum. Going to the salon is scary enough for your little one, so if you leave them alone you’re going to make that fear even worse. Instead stay with them and talk to them while they have their hair cut. Your presence alone will often be enough to settle them down. As part of the reason toddlers often freak out at the salon is because it’s new and daunting, it can be helpful to take them to the salon prior to their hair appointment. That way, they can simply sit and watch other people having their haircut and see what it’s all about. The more familiar they are with the salon, the less anxious they will be. Most salons shouldn’t object to this kind of exposure technique, but it is helpful to ask first rather than just turning up. Sometimes, your toddler may flat out refuse to calm down. Each child is different and some will take a lot more persuading than others. In this instance, bribery can work wonders. Let them know that once they’ve had their hair cut, they can have one of their favorite treats. This could be a food they love but don’t get to eat very often or it could be the bribery of a new toy. Whatever it is, you might just be surprised how well a little bribery works. Overall, toddler haircuts can be a traumatic experience for both you and your little one. The tips above will really help to ensure you survive the experience with your sanity still intact. Do you have any tips on how you survived your toddler’s haircuts? Let us know below! Haha, the last one is so true – bribery always works! With almost anything. If I may add another tip: if you can, bring the hairdresser to your house. That’s what we did. The hairdresser is actually a friend of mine and often cuts children’s hair as well as adults. When it was due time for my baby to get a haircut I rang her up and asked her if she’s willing to come to our house and do the haircutting here. She loved the idea and it luckily worked out. I think it makes the toddler feel safe and easy since it’s an environment that he knows very well. Plus it’s handy that you can just go change his clothes right away if he gets itchy and so on. Hope this helps all the parents out there. Yes, bribery works well Jane Lee, haha. Thank you for sharing the tip on bringing the hairdresser to the house. It’s a really good idea! And it would be a big plus if the hairdresser is someone familiar to your child because that would remove the ‘fear’ factor. Some kids are not comfortable around strangers or unfamiliar faces. In our culture, the first haircut for the baby, especially for the boys, is a very important event. The event is marked with rigorous rituals and ends with a feast. When the baby boy gets a first haircut, it is not a haircut actually, the boy’s head will be saved. It is believed that the hair that has been on baby’s head since he was not born is not good for health. generally, the baby gets the first haircut, or head shaving so to speak, at the age of 3. My baby is 5 months old and I will have to wait for a couple of years to get him ready for the hair cut. Wow! It’s my first time to encounter this information about some sort of a ritual for a haircut. I didn’t know something like it exists. We really learn new things every day. Our culture is marked with rituals in every stage of life. The birth is a great event, however, the 6th day and 11th day are also important. ON the sixth day, it is believed that Gods will come to the baby and write his fate on the forehead. On the 11th day, the baby gets a name. The first hair cut, which is generally done when the child is 3 or 5 years, is a great event. You’re quite right on most of the tips we can use to ensure that toddlers and kids around us have a peaceful haircut whenever the hair has grown. One very important tip you gave is understanding how your toddler reacts when others, the hairdresser, try to cut their hair for it is going to make things get better and us making it easier for the kids as well. One of my little cousin then, his poison when it comes to having his haircut was a snack. He would be chewing on the snack and fall asleep as his hair was being shaved. So therefore, I made it a point of duty to always buy snacks ahead in preparation for visiting the barbing salon. Also I would advise the use of well sharpened clipper’s blade in order to prevent the kids hair from getting drawn by tangling in the clipper because this is very painful. I have never thought of making use of this particular tip to taking toodlers to the salon before they get their hair cut as a means of getting them socialized with the act of getting a hair cut without worries and fright. I believe that this is mainly the reason why they freak out once the clippers get close to their hair making the buzzing sound. But once they familiarize with the sound of the clipper and seeing their fellow kids getting their own hair cut in peace, they would be intrigued by the prospect of getting their hair done as well.